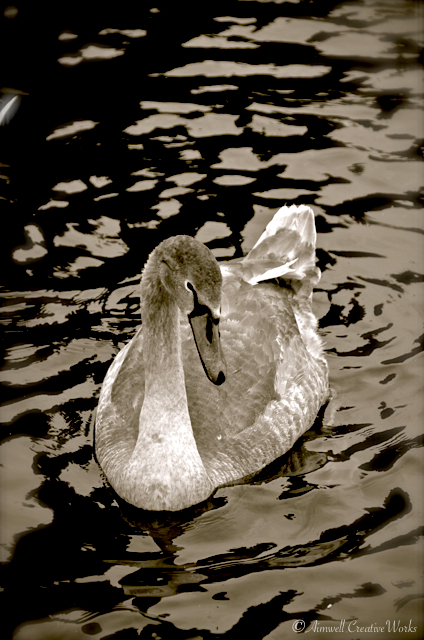 This not so ugly duckling is my submission to Leanne Cole’s Monochrome Madness this week. Of course, it’s not a duckling at all … it’s a beautiful swan losing its grey baby feathers. But every time I see one of these beauties I’m reminded of that silly song about the ugly duckling ~ a song I’ve been known to sing in the shower … to my rubber duck!!! This entry was posted in England, Nature, Photography, Travel, Uncategorized and tagged Aimwell CreativeWorks, beautiful swan, birds, black and white, Dorothy Chiotti, Leanne Cole, Light and shadow, Photography, Travel, ugly duckling. Bookmark the permalink. Lovely photo, the monochrome treatment is perfect. Thank you … It does rather show his handsomeness, doesn’t it?